Latin American poetry is so vast and overwhelming! I don’t know where to start! Yep. But Will Druce is here with a rough guide to Federico García Lorca, a look at where his writing intersects with Frank O’Hara and Rimbaud, and plenty else to say about writing and reading outside English. We also chat about building and rebuilding poetry communities when moving around the world, not publishing, and straight up beauty. This month we had poems from Phillip Hall’s new book Fume, new work from Sian Vate and Jennifer Compton returning to some of her early pieces. Enjoy! Which poet is there for you when life gets particularly strange? Sorry Rumi, but it’s not you. Lately I’ve had cause to go back to Gertrude Stein and her beautifully strange poem Christian Bérard. Fiona Hile reads from both Novelties and her new book Subtraction, Matthew Hall reads new work and Eddie Paterson responds to the theme of labour. What happened when I had four days off and decided to try to write a long poem. 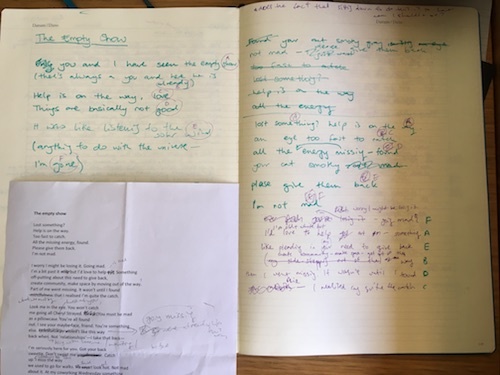 Sitting at Claire Gaskin’s kitchen table, I finally got to thank her for the ideas and poems she shared at a reading at Some Velvet Morning back in 2013, including Gig Ryan’s If I Had a Gun. We also talked about specificity, gender in poetry, writing from emotion, and took a good long look at Gig’s poem Eurydice’s Suburb.